UCL is one of the research powerhouses in Synthetic Biology in the UK, significantly contributing to the field in a number of areas. 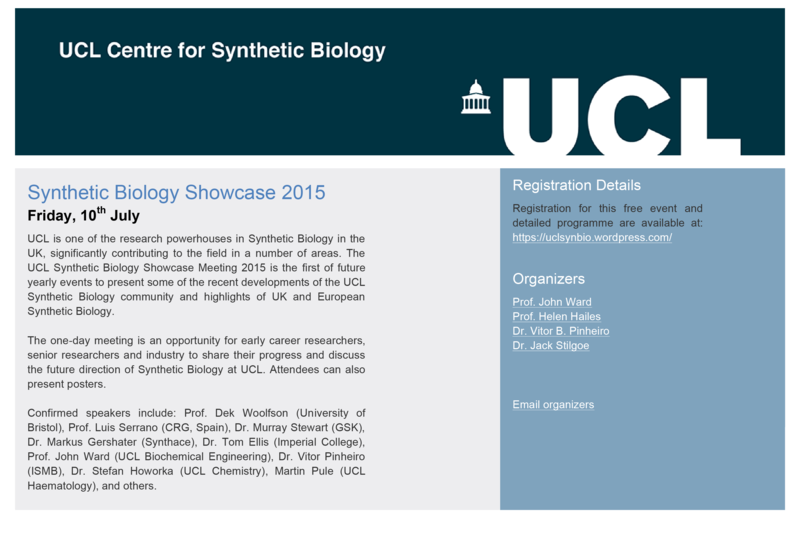 The UCL Synthetic Biology Showcase Meeting 2015 is the first of future yearly events to present some of the recent developments of the UCL Synthetic Biology community and highlights of UK and European Synthetic Biology. The one-day meeting is an opportunity for early career researchers, senior researchers and industry to share their progress and discuss the future direction of Synthetic Biology at UCL. Attendees can also present posters. Confirmed speakers include: Prof. Dek Woolfson (University of Bristol), Prof. Luis Serrano (CRG, Spain), Dr. Murray Stewart (GSK), Dr. Markus Gershater (Synthace), Dr. Tom Ellis (Imperial College), Prof. John Ward (UCL Biochemical Engineering), Dr. Vitor Pinheiro (ISMB), Dr. Stefan Howorka (UCL Chemistry), Martin Pule (UCL Haematology), and others.